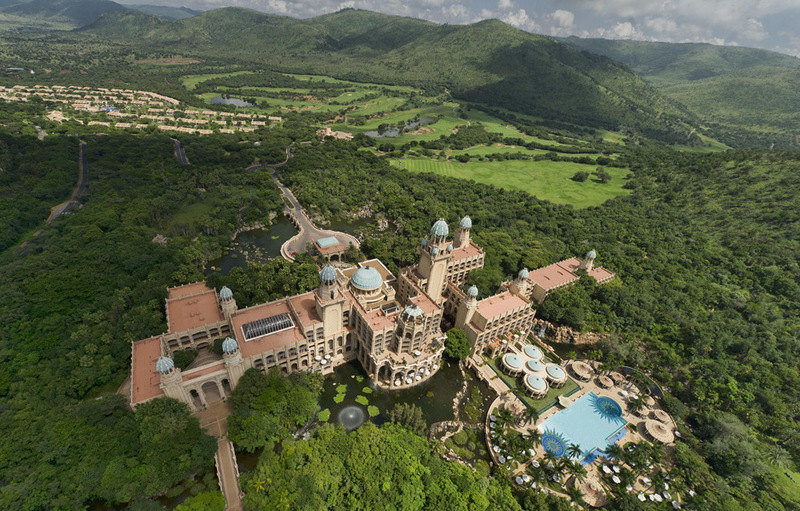 Lying deep in the heart of a long-extinct volcano and surrounded by the imposing Pilanesberg mountain range is “Africa’s Kingdom of Pleasure” - Sun City. 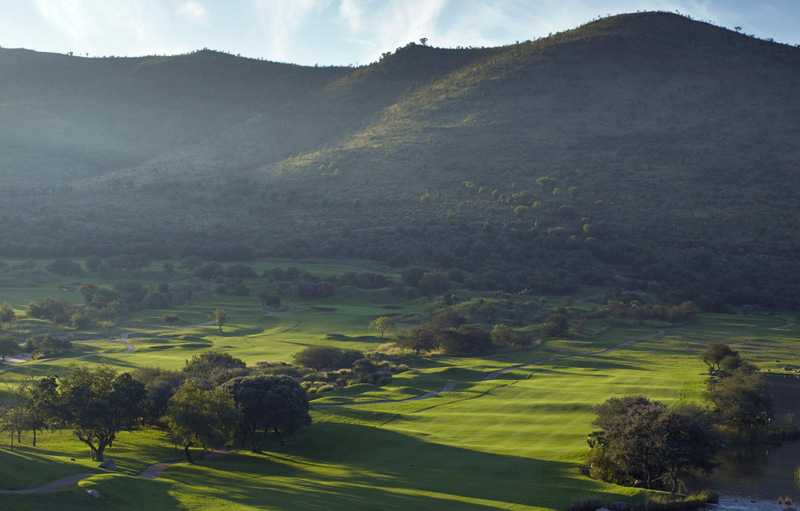 This internationally acclaimed family resort boasts two world-class 18-hole golf courses designed by the legendary Black Knight, Gary Player. Sun City has much to offer visitors, there is a choice of four hotels, family treats like the beach and waterslides at the Valley of Waves, a wide selection of sporting activities including; tennis, squash and volley ball and wildlife safaris in the nearby Pilanesberg Reserves. It is however, without a doubt, the opportunity to play two world-class championship courses that keeps local and international golfers coming back for more. Currently sitting in 3rd position (2012), the Gary Player Country Club is consistently one of the highest ranking courses on the Golf Digest’s “South Africa’s 100 Greatest Golf Courses”. Drawing on his vast international course experience, Gary Player designed this course to test every golfer’s power and finesse. The first course in South Africa to be built to stringent USGA specifications, it measures a massive 7,162 meters off the professional tees and loses none of its integrity when played off the intermediate or forward tees. 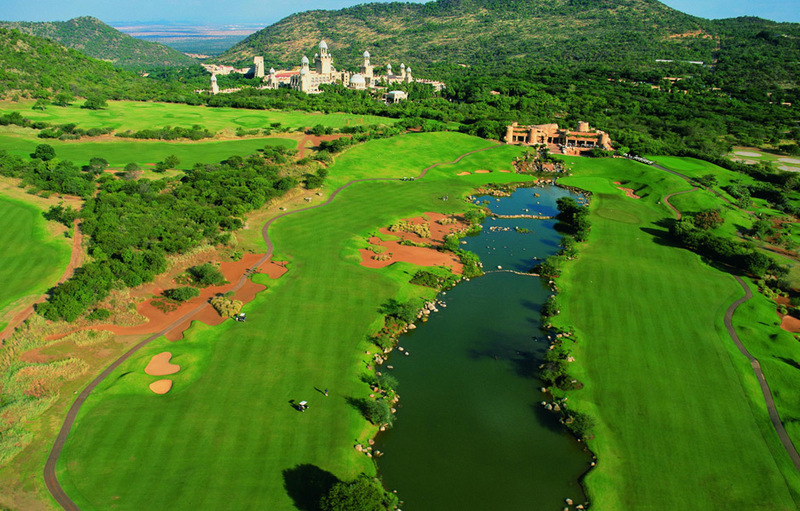 The Gary Player Country Club has been home to the prestigious Nedbank Golf Challenge since 1981. The course’s greens are lightening fast and the Kikuyu fairways perfectly manicured. Coupled with constant changes in elevation, imaginative bunkering and spectacular water hazards, even the most seasoned professional will be challenged. Stamina and accuracy are demanded on this tree-lined course. On a championship course like this, every hole is outstanding, but in terms of risk and reward, the par-five 9th with its island green, must be acknowledged. The clubhouse offers golfers all the amenities you would expect from a world-class facility including changing room, locker room, bar, halfway house, restaurant and Pro Shop which stocks golf clubs, exclusive attire ranging from Ashworth to Alfred Dunhill and other golf accessories. There is also a range of quality logo attire. 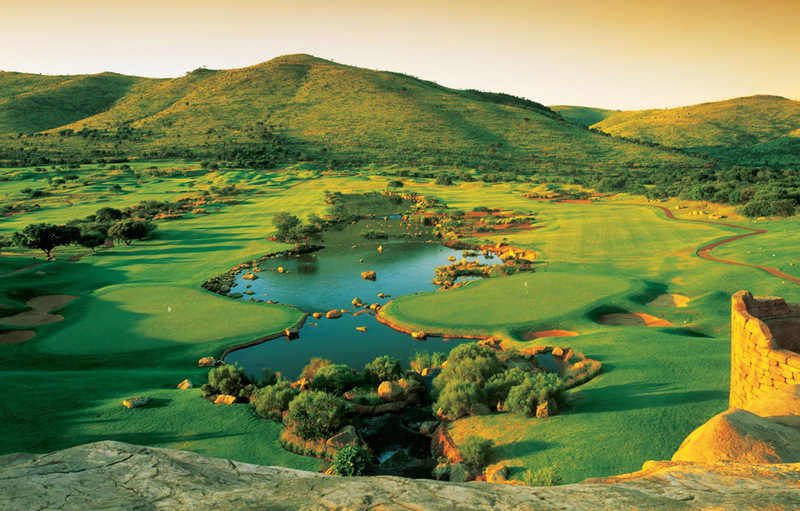 Currently ranked 20th on Golf Digest’s Top 100 courses, the Lost City Golf Course offers golfers a unique experience and awe-inspiring views across the African bushveld. Gary Player’s breathtaking desert and bushveld design reveals itself through careful incorporation of the natural surrounding bushveld with carefully placed bunkers, rock features, eroded gullies and water hazards. The course covers more than 100 hectares and has more than 28 000 square meters of water features. The Nile crocodile pool on the 13th hole is a major draw-card for international visitors looking for a little African adventure. 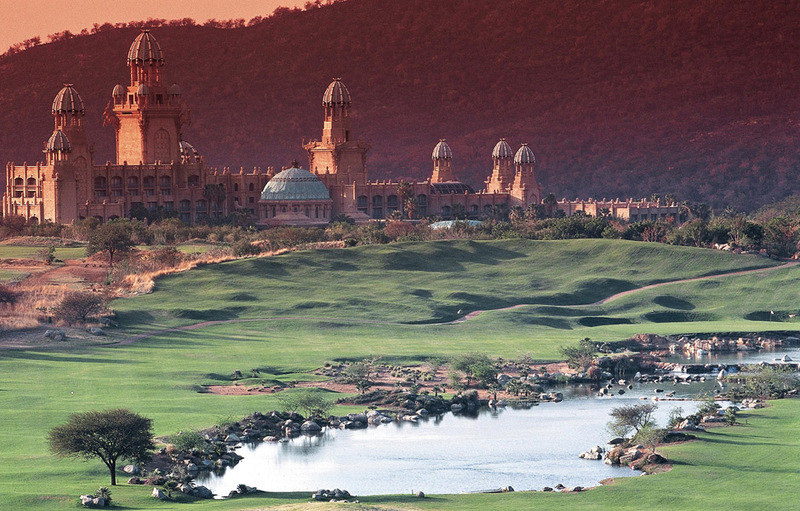 The Lost City Country was built ten years after the Gary Player Country Club and while predominantly desert –like there are also mountain and parklands areas on the course. Originally planted with the Bayview strain of Bermuda grass, the fairways were later replanted with Kikuyu making them hardier and easier to hit. A series of lakes separate the 9th and finishing hole. While longer hitting, single-figure handicappers will enjoy a round off the championship tees, the opportunity to hit off the intermediate and forward tees give fascinating and challenging test for golfers. 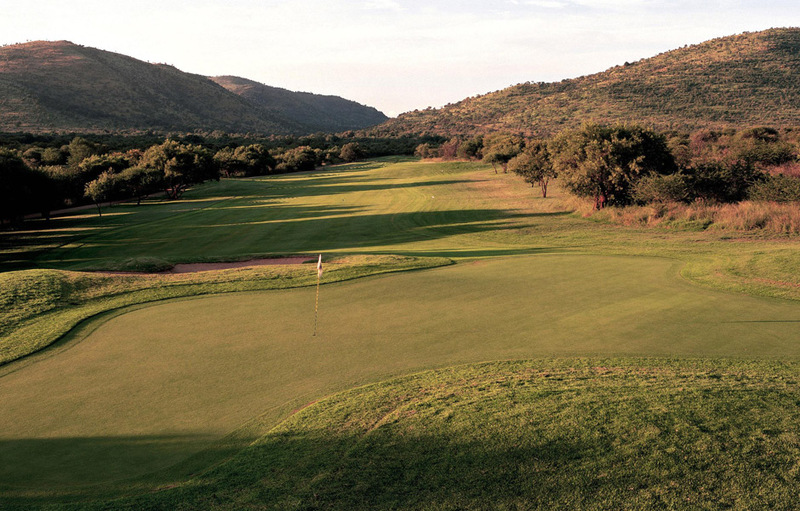 The wide Kikuyu fairways are a lush and green contrast against the bushveld terrain and the bent grass greens are receptive, though players should be cautious on approach. Many of the Lost City course’s holes are played from elevated tees, which offer additional excitement and challenges for golfers. The Lost City Clubhouse is also world-class with change-rooms, lockers, bar and a restaurant. Be sure to allow time for sundowners after your round at the Ruins style clubhouse overlooking the 9th and 18th greens. Sun City’s driving range, located at the Lost City course, is 235 meters long. There are practice greens available. Private instruction and group lessons are available to golfers.